It took just a few days to receive my Monoprice Maker Select 3D Printer, and it was difficult to not be excited about it. I’d like to share my thoughts on how well the first prints have gone. When I first got the printer, it came in a pretty hefty box with some nylon straps insulated between some heavy foam held by a couple of pieces of tape. In all honesty, it didn’t need much more than this since it was pretty well-sized to the box. Given this, I was quite happy to find out that the Monoprice was neatly packed meaning it would be unlikely for any serious damage during shipment of my printer. When you first open the box, you’ll notice a set of instructions. Since it was the first thing that pops into your eyes, I thought I’d give it a read first, even though I normally like to skip past this and dive into printing. Below the instructions you should find a giant power brick that contains wiring and the LCD display. There will also be another box that has all of the accessories that go with the printer. Since the printer was so tightly snug in the box, it was somewhat difficult to remove it from the Styrofoam it was encased in. What’s not quite evident is that when you pull the printer out of the package, it’s not the easiest thing. If you were to yank on any of the components, it would have most likely fallen out and collided against the table and therefore damage the printer if you weren’t being careful. The other thing that might be a little unclear is which end is up on the tower. After looking at it multiple times, I was able to figure out that the motors were toward the bottom of the printer, but this might not be quite obvious upon opening the box. The image above should give you an indication of everything that came with the printer. If you see a part that’s missing, contact customer support and they’ll be more than happy to help. From my personal experience, they have superb customer service, which I was very grateful for since I don’t have a lot of experience with 3D printers. In the box you should find the base, the tower, the power unit, the rack for holding the roll of either ABS or PLA tape, a power cable, a USB cable, 4 screws (for mounting the tower), additional screws, a clear tube, zip ties, a putty knife, a 2 GB SD memory card and some allan wrenches. The build itself for the Monoprice Maker Select 3D Printer was actually quite simple, even though I was a little bit nervous. The tower attaches with the four screws to the base. The base sits on top of the ledge found at the top. All of the bolts should be found in one, tiny bag. There’s really not a whole lot to it, but it’s rather a matter of lining it up and orienting everything properly. At one point you will need to attach the different motors, and the instructions clearly outline which wire goes to which motor. The connectors should be able to just pop in, especially since they only fit one way. This makes it a pretty straightforward process. Once it’s all together, the printer itself is actually quite stable. I would say all-in-all it took me about an hour, and this was mostly because I was taking my time and going slow to make sure I got everything correct. I actually ended up doing this twice because the rear end tended to pop upwards as I was putting things together. Once you get the spool holder installed, it’s time to power it up. The first step you’ll need to do is calibrate the gantry. In order to do this, you’ll need to pull the y-axis forward and tighten all of the wing nuts as tight as they can go. This will compress the print bed and bring it to its lowest point. From there we’re going to raise and loosen each wing nut to loosen the board and bring it just within a sheet of paper width (as described per the instructions) of space between the board and the print bed. When you power it on, the LCD screen will walk you through the instructions. The extruder will be brought down and run through the positioning and set everything to “Home All” in order to set everything in the starting position. 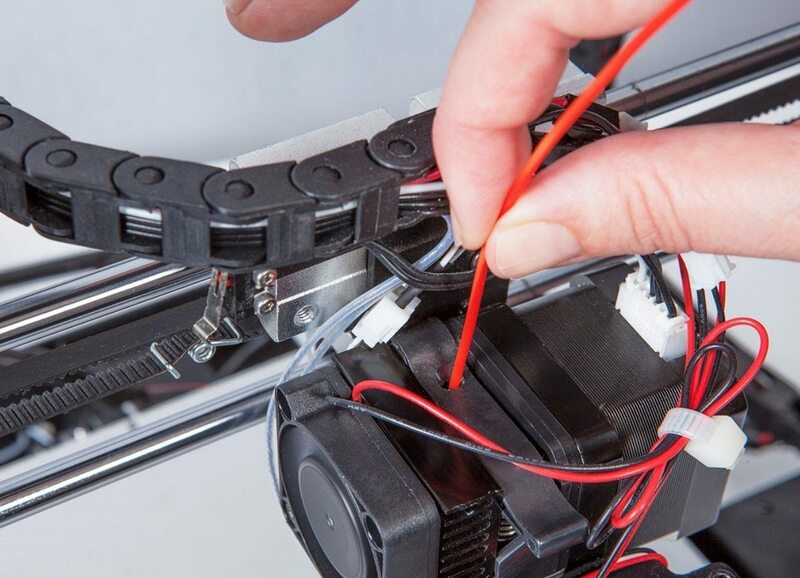 As you start sliding sheets of paper under the extruder, try not to get caught up in the screws. This could be the source of some friction. Overall, this is something you want to get right since it will have a lot of effect later on when you start printing. If the extruder is too close to the board, it’s going to cause finished prints to stick. This is really bad and will force you to loosen things a bit. After destroying the sheet of tape that layers the board with my second print, I vowed to never do this again since it damages the print and both the extruder and print bed. While it is a sturdy machine, it’s best to take care of it as much as possible. You just want to go slow enough to get it right. You’ll need to line the sheets of paper on the bed, and once the bed heats up it will be easier to get rid of the air bubbles. This is what the putty knife is for, and it will definitely make for quicker setup. Now the most important part about the Monoprice Maker Select 3D Printer: the print quality. The printing will being by preheating either the ABS or PLA tape into the printer. You made need to take the fan in order to hark the filament through if it kicks back on you. This happened to me, and the extruder just wouldn’t push it though any further. Just pop it open and push it through manually if this happens to be the case. Once that’s finished, you can begin printing. The SD card comes pre-loaded with roughly 5 models, and I tested the print quality by printing the Monoprice logo. The LCD screen told me the exact progress of the printing as well as exact coordinates of the x-, y- and z-axis. I was very impressed with how well the printer went together. In the past I had assembled a Reprap Mendel, and it was a much longer and much more difficult process. This time, it was nice to be able to put in 4 screws and begin printing within just 45 minutes. The software that I’m using is the Cura software works great, and the printer functions very well. My best advice is to use a brim or a raft. If you do something small, use a brim, and then for bigger prints use a raft. After viewing my finished print I was quite pleased with the quality that it had produced. A lot of printers have quite a bit of string and unfinished edges. I eventually got to doing more complicated prints, and sure enough complex detail wasn’t exact, but if you’re making something that wasn’t super detailed this printer is perfect for what you get, especially since it’s one of the cheapest on the market. For very complex detail, you’d probably want to go with a high-end printer, but you’ll be looking at spending at least $1,000 if not more. That’s why I was pleased to know that I could use this printer to print basic things that I needed at home and some extra pieces for my printer in case if it ever need something replaced. If you print in PLA, the prints will come out nearly perfectly. ABS might turn out different results. With PET, sometimes I’d find blobs getting periodically printed or producing a lot of stringing. Sometimes layers wouldn’t fuse well with the layers below it, so we highly suggest sticking with PLA. The Monoprice Maker Select 3D Printer is one of the best in its class for its price. You won’t get much detail out of more complex prints, but you wouldn’t be buying such an inexpensive printer in the first place if that’s what you were looking for. I suggest this printer to those who need an entry-level printer or simply just want to make prints for fun and use them for basic things that you buy around the house. If you want to get a bit fancier and make detailed shapes and quick-turning edges, we recommend you to the Makerbot Replicator. Just don’t expect plug-and-play for this price, but for only $350 this is definitely an option most should look at. An excellent choice for those just getting started in the 3D printing world.